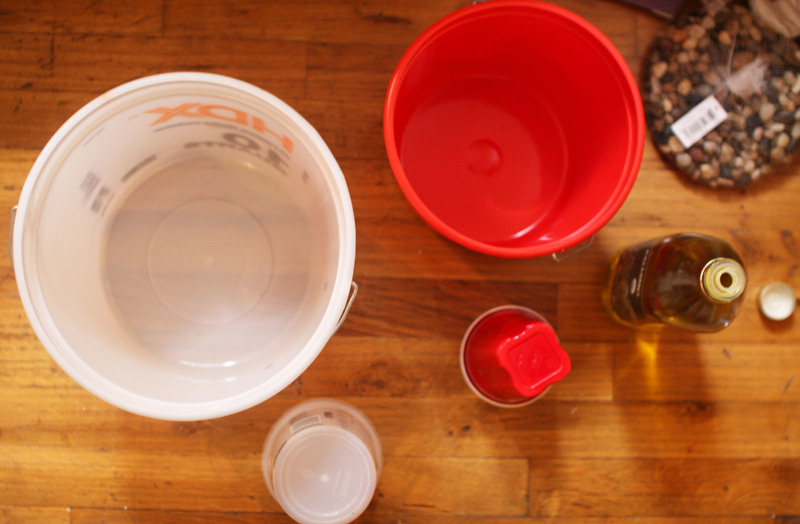 This is a :make: post I’ve been wanting to do for a REALLY long time (I’m talking years!). Concrete is something I’ve been experimenting with on and off for quite a while now and I’m finally at the point where I feel comfortable working with it and confident that I can get a consistent result each time. But don’t let that put you off giving this a go! One of the great things about concrete is that it perfectly encapsulates one of my favourite things ever, the Japanese concept of wabi-sabi, which can roughly be explained as the the appreciation of the imperfections of nature and the transience of natural beauty. So if you get little cracks and imperfections in your planter that’s all just a part of its beauty! 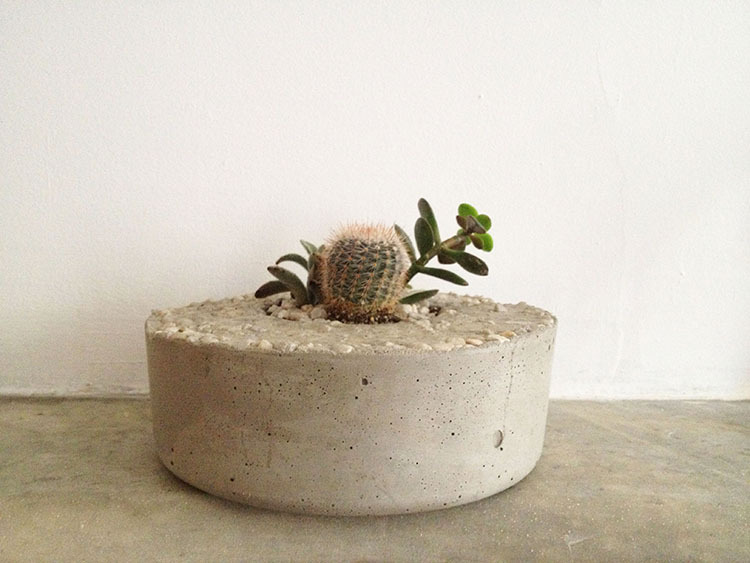 I love concrete planters especially because I love the way concrete weathers and changes over time, and I think the combination of the grey concrete with the green plants is hard to beat. I’ve been making these planters with the hopes of selling them through some store here in New York, and they will also feature in the brand new online store I have in the works (watch this space!). If you want to have a go at making your own, though, here’s how to do it! 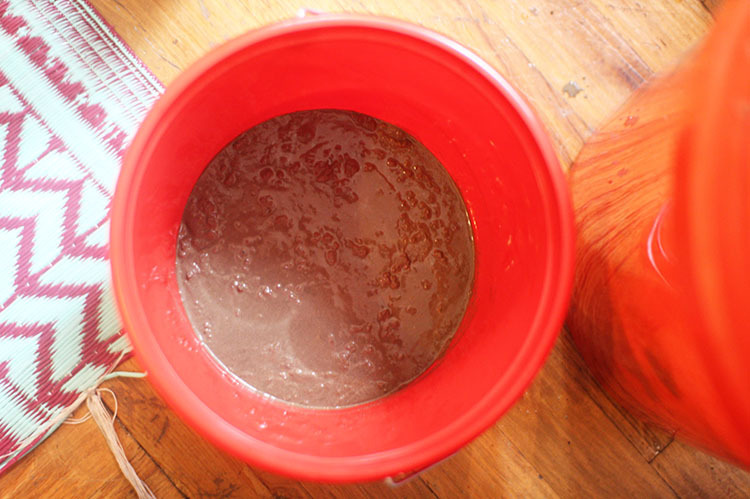 two plastic buckets or containers, one to form the outside of the mould and one to form the inside – I used a bucket measuring 18cm in diameter for the outside and a plastic cup measuring 7cm in diameter for the inside. The difference between the two diameters will determine the thickness of the sides of your planter (so my sides were 5.5cm thick). I would recommend making one with sides at least 3cm thick to start with because you have a much better chance of it holding together well and being nice and strong. Start by preparing your moulds. Plastic containers work really well as moulds because they’re strong, waterproof, a little bit flexible and easy to come by. To make the concrete easy to remove from the mould, you need to grease it up just like a cake tin. I do this by dousing a scrunched up piece of paper towel in oil and wiping it all over the inside of my large mould and the outside of my small mould (don’t forget this one!). Next you’ll need to mix your concrete. 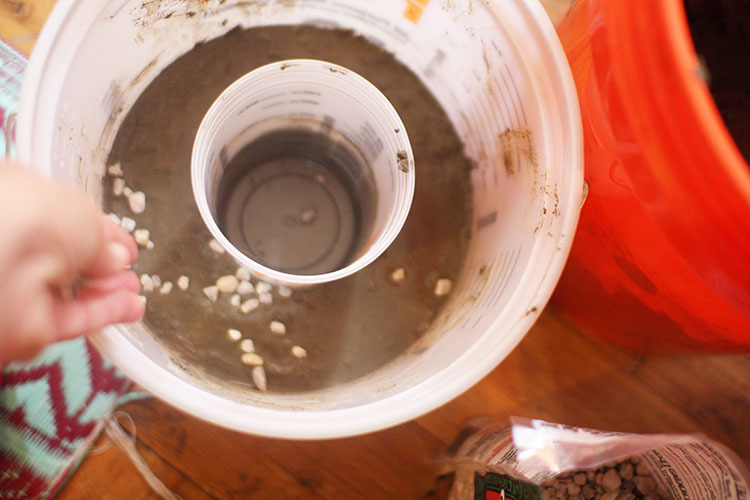 There are usually instructions on the packet as to how much water to add, but basically I just put some dry concrete in a bucket and start adding water slowly and mixing with a trowel until it reaches the right consistency. Be careful not to overdo the water – you don’t want to end up with a soupy mix! 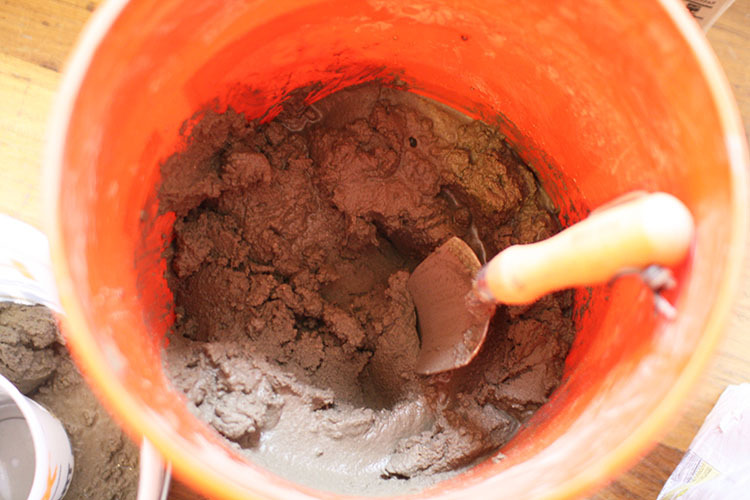 Ideally you want your mixture to be at that perfect trowel-able consistency – think about the mortar you’ve seen brickies using over the years, or those mud pies from your childhood! 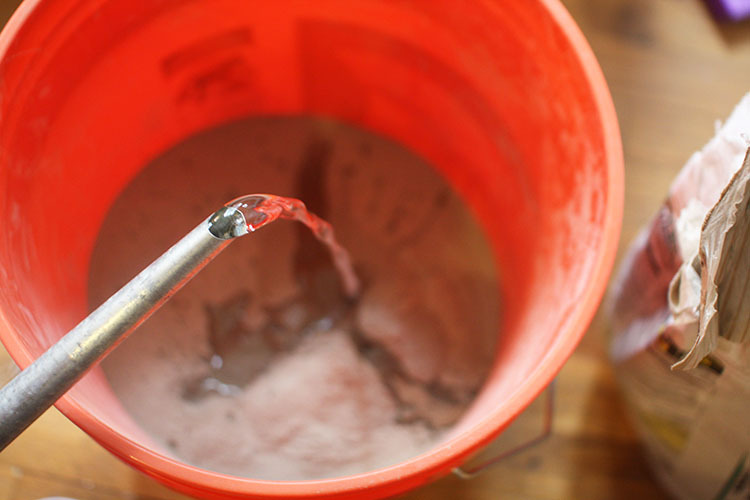 Put another way, it should be easy to mix with a trowel but not watery. Once your concrete is mixed, pour enough into your outside mould to cover the base to a thickness of around 3cm. Then carefully place your inside mould in the middle of the concrete and push it down about a centimetre into the concrete. Make sure there is still about 2cm of concrete underneath the inside mould as this will be the base of your planter and needs to be thick and strong. Put something inside the inside mould to weigh it down – I used stones but you could use rice or sand or anything that came to hand that had a bit of weight to it. Top up the concrete around the sides of the inside mould until it reaches a depth of about 10cm (or whatever you want the height of your planter to be). If you want a textured look to the top of your planter, you can sprinkle some little stones over with your hands. Press them lightly into the concrete to make sure they are embedded enough not to come loose once it’s dry. If you want to leave the top plain just make sure it’s even and as smooth as you can get it. 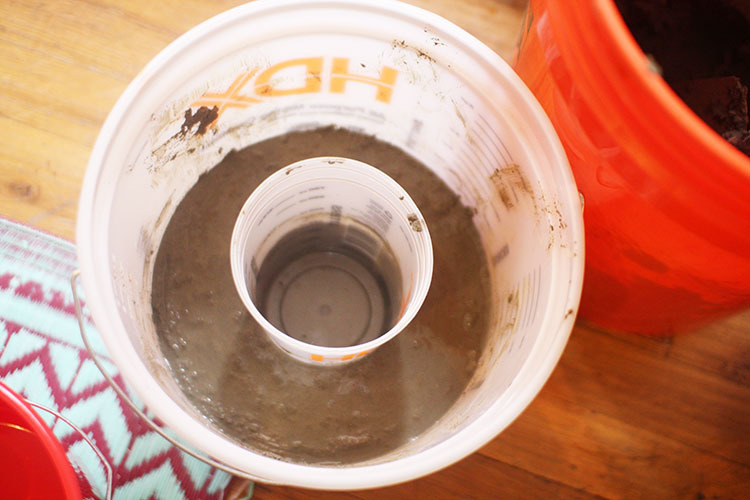 Leave your concrete to cure for 48 hours. After that time, it should appear completely set. 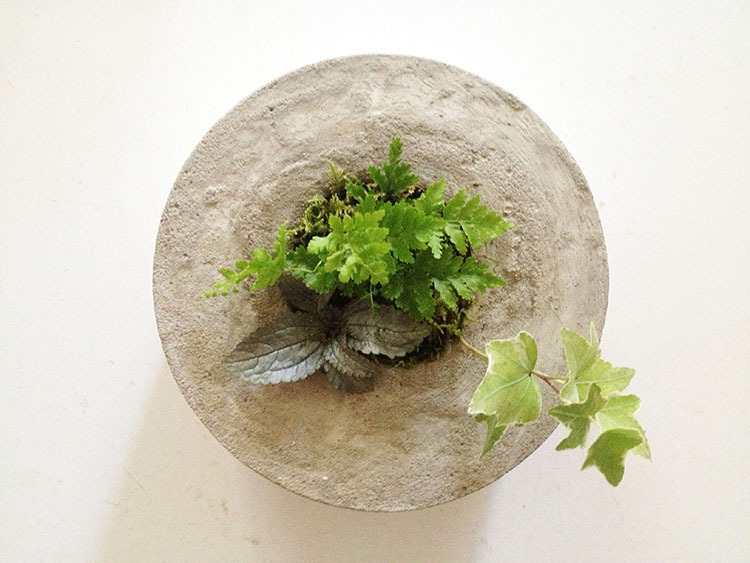 Gently flex the sides of your inside mould to loosen it and jiggle it around until you can slide it out from the centre of the concrete planter. Gently flex the sides of your outside mould, then invert the mould and jiggle it until the planter comes loose. Be careful because although it’s very strong, concrete is also very brittle so make sure you ease it out of the mould with your hands, rather than just letting it drop out, or it will break! Once you have your planter out of the moulds leave it upside down and let it cure for another 24 hours to make sure it’s completely dry. Finish off your planter by gently sanding off any rough edges with fine sandpaper, then coating it with a layer of waterproof sealant (I use this one). You won’t be able to see this but it will help protect your planter and give it a nice smooth finish. 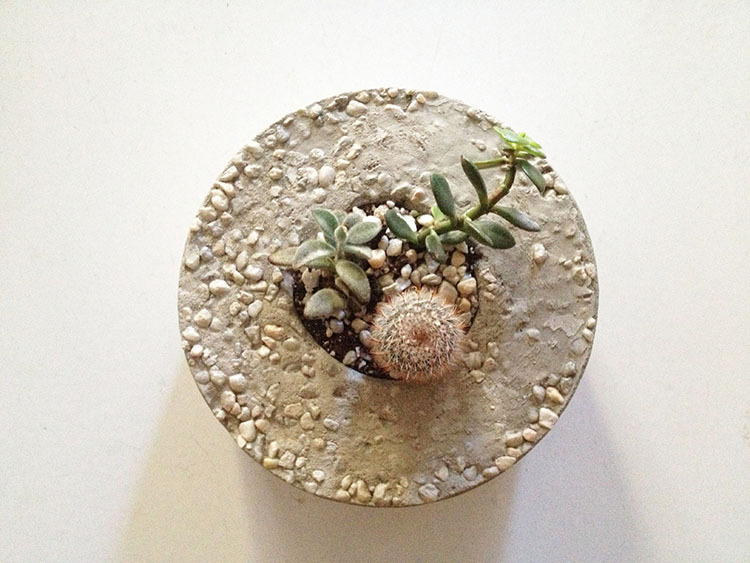 And of course, finally add some soil and tiny plants to your planter! Because these planters don’t have a hole for drainage, you’ll need to be careful when watering not to overdo it or your plant’s roots will rot. Or just plant succulents, which need very little water and are fine in containers without drainage! 07 Oct	This entry was published on October 7, 2013 at 2:36 am. 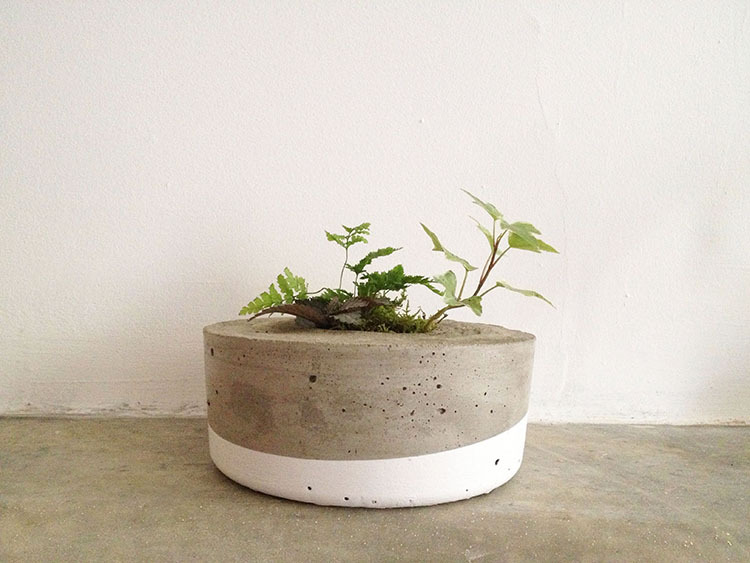 It’s filed under make and tagged concrete, DIY, green, home, make, planter, plants. Bookmark the permalink. Follow any comments here with the RSS feed for this post.